Description: B&O GP30 6944 and WM GP7 5633 work at Baltimore, MD in October, 1977. With permission. Description: Old B&O Geep in the maintenance shop wearing Sunburst scheme. Description: Again, I don't know what the blue locomotive is. 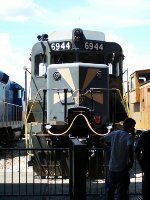 Last view of the CSX MoW paint - was this one the last example left? It is back to its 1982 Chessie glory now. Description: B@O 6944 and WM 236 side by side. Description: A former sleeping car from the Amtrak Heritage fleet rests outside the old car shop with B&O GP30 6944. Description: Sorry for the chain link fence view but that's all I could get as we passed by the engine shop.